Some identify spring by flowers blossoming, grass turning a deeper green or the birds chirping. That’s nice, I suppose, but we have a more accurate marker of when spring arrives: the reopening of Bubbling Brook Ice Cream in Westwood, Mass. To the joy of many, Bubbling Brook reopened for the 2016 season in late March. During the spring, Bubbling Brook restaurant typically begins the day at 11 a.m. and stays open until 8 p.m., with the ice cream stand in operation until 9 p.m. Given the crazy weather as of late, I would always call ahead at 781) 762- 9860 to make sure “The Brook” is open! Hard ice cream flavors that I recommend are black raspberry chip, chocolate peanut butter, pistachio and mint chocolate chip. Also, this is a first: Bubbling Brook is now offering chocolate sprinkles! The lack of this popular ice cream add-on has been kind of a running joke amongst locals through the years; nice to see this staple finally arrive! Bubbling Brook also has a nice variety of soft serve ice creams, including “Brook Blasts” which include tasty mix-ins. The soft serve window is not open yet, though; we’ll keep you posted on when it does. 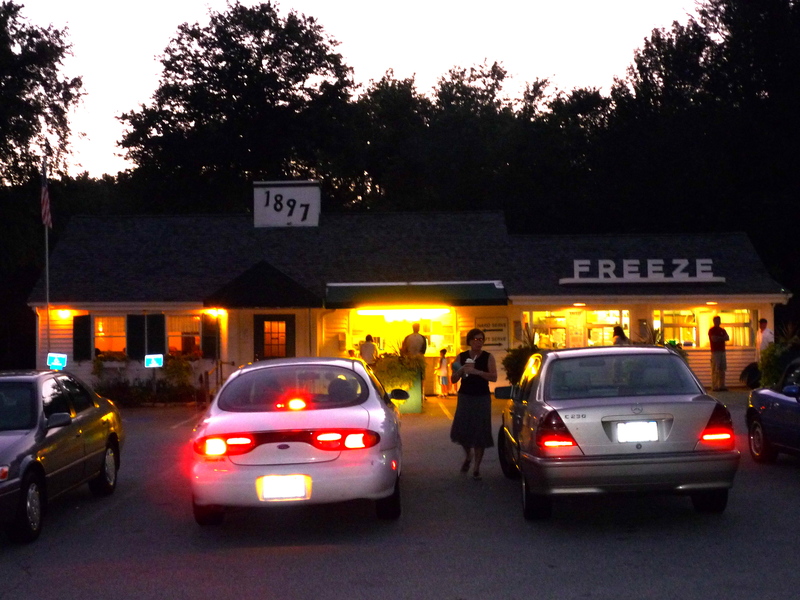 The classic outdoor ice cream stand with the pleasing yellow lights at night, the comfort foods (great fried clams!) at the inside dining room, the picnic tables on the expansive lawn and the brook that bubbles slightly create a familiar and beloved setting. How much do people love Bubbling Brook? In a totally unscientific experiment, I’ve noticed cars pulling into the lot for the past three weeks but only to see the boards still up. Believe me, these people are not driving into the lot because they are lost! The lazy Sunday afternoon, the after-dinner treat as the sun starts to go down and the logical extension to a place for the family to go after a kids sports activity all serve as great reasons to hit the Brook. But, really, any old reason will do. Believe me, I think I’m up to about 1,000 ways to validate a visit to Bubbling Book! Bliss Family Restaurant and Ice Cream Shop, Attleboro, Mass. Richardson’s Ice Cream Stand, Middleton, Mass.